It’s six years now since the video distribution market exploded due to the introduction of HDBaseT. At the time, our industry was restricted to poor quality HDMI over dual CAT solutions that could operate to a maximum of 40m. The idea then of distributing 4K video, 2-Way IR, PoE and RS-232 over a single CAT cable was simply unthinkable. HDBaseT changed the face of video distribution, providing installers and integrators with the tools required to deliver unprecedented standards of performance and flexibility. Suddenly delivering whole home video distribution and control became feasible and the market has been growing rapidly ever since. The introduction of 4K UHD has been the latest and greatest advancement this industry has witnessed in the last 10 years. It has however thrown up some weird and wonderful complexities that all manufacturers of sources, displays and distribution solutions are having to adapt to. The fun begins with the sources and their output resolutions. 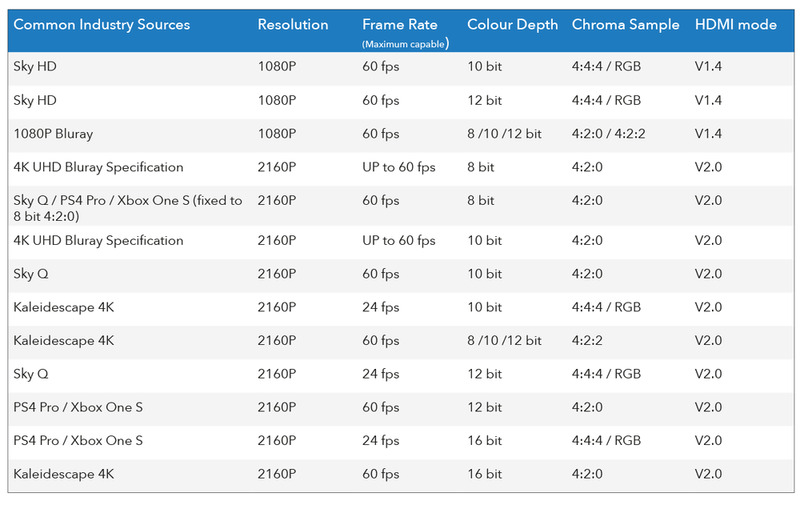 Leading manufacturers of common sources are outputting a variety of different resolutions, essentially different flavor of 4K. The table below highlights key source brands and their flavor of 4K output. Installers now have new layers of complexity to consider when installing multi zone, multi source systems in homes or commercial properties. As the popularity of HDMI distribution grows so does the number of potential issues that need to be overcome. Resolution support, bandwidth capability and EDID compatibilities matter more than ever before. I remember evaluating video over IP in 2010 and the performance limitations were a serious barrier to sales. At the time switching times could be eight to ten seconds, resolutions were limited to standard definition, you had snow screens during switching and ghosting on moving images made watching sport practically impossible. In contrast today, video over IP has become a serious contender for almost any standard of AV installation. During the last three years key manufacturers like ourselves have been developing advanced IP solutions that are delivering new levels flexibility and video scaling essential in todays complex 4K marketplace. Within 12 months of launch our Multicast IP solutions are being installed across the world in homes, yachts, cinema chains, department stores, airports, hotels and broadcast studios. We have been staggered by the level of opportunity that IP technology has delivered for the brand. The ability to specify a system of any size and simultaneously scale the resolution of all components in the system is unprecedented. Ultimately, HDBaseT is still the undisputed industry benchmark for multi-zone video distribution. The delivery of 4K UHD from common sources such as SKY Q from a convenient rack location will always suit the robust performance and advanced features of HDBaseT. Video over IP is becoming increasingly important as installations become larger and more complex. For the first time AV integrators can specify a system of practically any size and seamlessly program the receivers to output the dedicated resolution and EDID settings to suit the display. There is a myth with IP distribution that it is a pig to learn and network qualifications are required to program switches. While this previously may have been the case, with Blustream Multicast we enjoy challenging anyone to come and see how easy it is to configure and install a system in a matter of minutes. Our wizard software takes users on a step by step process for assigning IP addresses and configuring the EDID settings for all components in the system. You can even manually configure a whole system without the need for a PC, simply by plugging in the units and using the buttons on the front for configuration. During the last three years we have embarked on an annual roadshow throughout the UK to support all of our loyal partners with industry leading training and updates from ourselves and some key manufacturer partners. This year we will be delivering an IP workshop that will give any visitor the confidence to start installing Multicast UHD. This summer will see the launch of our latest HDBaseT Matrix. The new Custom Pro matrix is our first modular solution but with a key difference. Rather than specify individual ports, we have designed a solution that offers a level of flexibility but maintains and enhances the level of both performance and reliability. Our robust interlocking input design and flexible control board options make specifying the right matrix for the project in hand easier than ever. At this year’s Blustream roadshow we will be supported by some innovative brands in our market including HDL, DemoPad, Kordz and Metz Connect. Representatives from all brands will be on hand with live demonstrations and presentations of their latest products throughout the day. Phil Davis is Sales and Marketing Director of Blustream UK. Over the last 10 years his career has developed working with several market leading video distribution manufacturers.